← Oh quit your whining you little girl! I recently came across an article about an event Martha Stewart put on last week. It was called Martha Stewart’s American Made Market and was held at the Grand Central Market in New York. I was intrigued. I had always thought that most of Martha Stewart’s products were made offshore, but I figured I was wrong. So I went to Martha’s website for the scoop. It turns out Martha’s American Made Market event didn’t feature Martha’s products but those of others. According to Martha’s website, “The American Made Awards honor makers from across the country for innovation and excellence in their field. From reprising a lost art form and impacting a community to pioneering an industry, each maker is honored for their role in pushing the American Made movement forward.” That’s all well and good, but I thought Martha should have been blowing her own horn since if Martha was leading the Made in America charge, most if not all of her Martha Stewart Collection products must be made on our shores. Hmm, I wonder why she chose not to do that? Well it turns that the lion’s share of the Martha Stewart collection is not made here, its made abroad. Martha discusses this in this video with a Fox News reporter. Once I learned this fact, two phrases came to mind. The first is, “Do as I say, not as I do.” If Martha really wanted to help revive American manufacturing, she would boldly state that by the close of 2014, the entire Martha Stewart Collection would be made stateside. 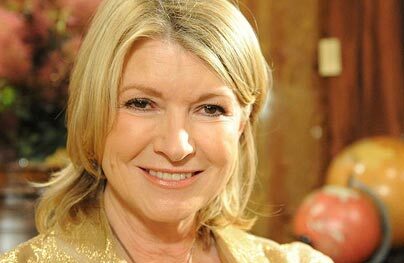 If it cost a little more to make her stuff here as opposed to the Middle Kingdom, Martha might offer to use part of the $21.2 million she made between 2009 and 2011 to help out. Besides, after the problems Martha encountered last year from stuff made in China, you would think she might have learned her lesson. The second phrase that came to mind when I discovered the truth about where Martha’s products are made was “The best defense is a good offense.” In order to draw attention from the fact that hardly any of her products are made here, Martha creates an American Made campaign focusing on people who actually run businesses whose products are made by members of our extended American family. Wow, that takes real chutzpah! So if you want American made products, I wouldn’t waste any time shopping the Martha Stewart Collection. Instead buy Fiestaware, Libby glasses and Lamson & Goodnow knives. You will get great products for your kitchen and table and will be providing employment for members of our extended American family who so desperately want jobs. That is a winning combination. This entry was posted in american made, China, cooking, Made in America, made in usa and tagged China, fiestaware, Lamson & Goodnow, Libby glass, Made in America, Made in the USA, Martha Stewart, Martha Stewart Living Omnimedia. Bookmark the permalink. Ironically, “Martha Stewart” branded products don’t necessarily represent the most “economical” offerings, especially considering their overseas, “low cost” origin. Meaning It wouldn’t be difficult for those items to be manufactured in the US, and still charge the “Martha Stewart” brand premiums. Of course, she may have to surrender a few hundredths of a percent of net profits. Also, didn’t Starbucks up in your neck of the woods announce a “Made in US” campaign a year or two ago? What’s happened with that? Every time I’m in a Starbucks, I search high and low for the “Made in USA” products and have yet to find any. I would expect, at the very least, they’d carry Liberty Bottleworks products (which I believe you’ve profiled here) since Liberty is in Starbucks’ back yard. And certainly, the 100% US sourced and manufactured Liberty Bottleworks aluminum water bottle fits right into their price model. Thanks for the thoughtful comment. Of course Martha Stewart could make her products here, but she along with countless others (Rachel Ray etc) have their branded products made overseas because it is allegedly cheaper. But that is changing. As to Starbucks, yes they did do a very brief Made in the U.S. campaign and sold some wrist bands. But soon that was forgotten. They sell a few American made plastic coffee cups, but other than that all their stuff is made in China. Can you imagine the impact Starbucks could have on jobs in this country if it decided to produce all its cups etc. here in the States. My god. Finally, Starbucks doesn’t sell Liberty Bottleworks bottles, but they should. I have a great Liberty bottle with a map of Mt. Rainier on it. What a bottle! If you would like to continue to chat about this subject, drop me a line at (simplyamericanbriggs@gmail.com) or give me a bell (206 795-7668).